Dimensions 45'11" by 34'5" by 15'11"
One flexible downward-firing 7.7mm Type 92 machine gun. Production A total of 530 E7Ks were built. Variants The E7K1 used a 600hp Hiro Type 91 12-cylinder liquid-cooled engine. 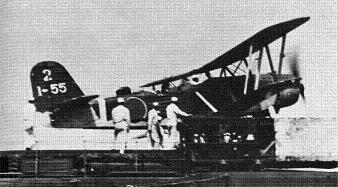 "Alf" was Kawanishi's response to a 1932 Navy call for a three-seat long-range reconnaissance seaplane to replace the E5K1. The design team, led by Sekiguchi Eiji, produced a prototype in less than a year, which was delivered to the Navy in May 1933. Its performance and handling were found much superior to the competing Aichi AB-6 and production was begun late that year. The original aircraft (E7K1) used a liquid-cooled engine and wooden propellers. However, in 1936 the Navy became interested in an updated version using a much more powerful radial engine driving a metal propeller. This went into production in November 1938 as the E7K2. "Alf" was well-liked by its crews for its reliability and ease of handling. The E7K1 was relegated to training by 1941, but the E7K2 was still in first-line service in spite of its obsolescence. It was not fully replaced by the E13A "Jake" until early 1943.